The Downtown Dispensary offers several high-end and affordable cannabis products to Tucson’s medical marijuana patients. Our flower and iLava + MedLava extracts are made in Tucson and are tested for safety and potency. We also carry edible products made by other AZDHS licensed facilities. We offer delivery to medical marijuana patients in the greater Tucson area and are one of the only delivery services to accept debit cards at your doorstep. Daily specials are also available for delivery customers. iLava vapes, topicals & MedLava concentrates are manufactured using the highest quality raw materials and are processed using best practices in extraction and purification methodology. Both iLava & MedLava are manufactured exclusively by The Downtown Dispensary. Each batch is independently tested for potency and contaminants. The Downtown Dispensary only carries edibles, topicals, inhalers, and concentrates from reliable brands that we believe to be safe and valuable for patients. We are stringent about ensuring that our state-licensed vendors are informing our staff and patients about shelf life stability. The Downtown Cultivation facility produces a variety of strains that are grown using high quality nutrients in an indoor environmentally controlled pesticide-free environment. We ensure that each batch is tested for potency and contaminants using gas chromatography–mass spectrometry testing and post lab results here. We also carry medical marijuana from select vendors and carry the best flower we can find in Arizona and sell it within our Reserve Tier. Consumers of Δ8 THC have reported experiences that include clear-headedness, soothing body sensations, and relaxation with a lower psychotropic effect. If you are looking for deep physical relief without feeling out of tune with your senses or mentally bogged down, Δ8 Clarity is the product for you. It is available in 6 strains and an exclusive PURE | RAW formula at our Tucson locations. 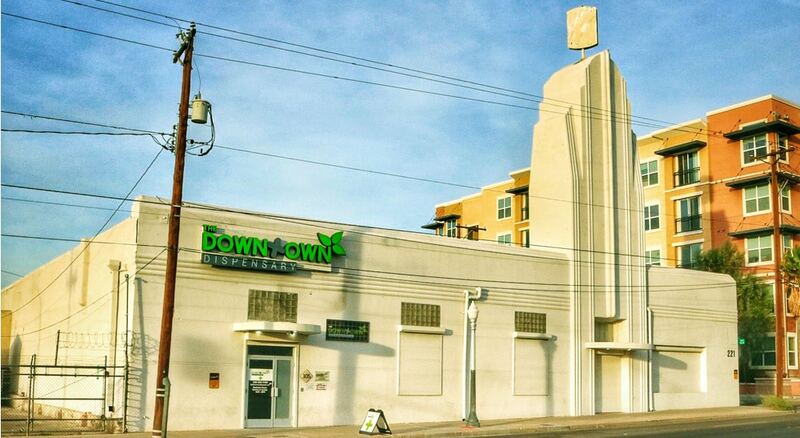 The Downtown Dispensary is an Arizona state licensed dispensary in Tucson located near the intersection of 6th Avenue and 6th Street. We have been licensed to operate by the Arizona Department of Health Services and have been serving patients since August of 2013. The Downtown Dispensary brings Tucson the ultimate medical marijuana retail experience and the highest quality customer service to compliment our multi-station prepacked goods or deli flower dispensed in press-down child-resistant containers. Educational videos with the latest cannabis content are played in our waiting area daily. The Downtown Dispensary is open every day to serve qualified patients and provides an environment conducive to learning about the products, where patients are informed on the different strains of medical marijuana in relation to their ailments. Patients interested in learning more about this alternative medicine have the option to receive educational materials containing information such as product types, forms of administration and side effects. Every year, the Downtown Dispensary commits some of its proceeds to patient programs as well as other non-profit and charitable organizations that educate patients about their rights. The dispensary's board has worked on improving patient access and is working to reduce patient registration fees to help qualifying patients. The directors of the dispensary have distinct backgrounds on regulatory compliance, finance, and health information systems.